For patients who live in remote areas (overseas) or have difficulty visiting our hospital due to pain, gait disorders, and so on, we can offer online consultation services in the form of video chat via a computer or smartphone. Send us MRI scan image data of the affected area by email or regular mail in advance, and our doctor will be able to give an opinion in an online consultation. 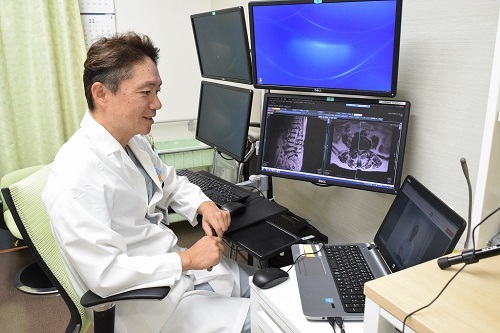 If we decide that your condition is an indication for surgery in our hospital, we can then proceed with arrangements for your visit to Japan to undergo a surgical procedure. Additional charge for extra time: 5,000 yen (up to 15 minutes). *Fees will be automatically drawn from your pre-registered credit card. As a rule, we do not prescribe medications or provide treatment in online consultations. Currently, the online consultation system (the app) can only be installed on Japanese smartphones, and it is not available in any languages other than Japanese. If your smartphone is not Japanese, you need to access via a computer. To schedule an appointment for an online consultation, please go to this page (in Japanese) .